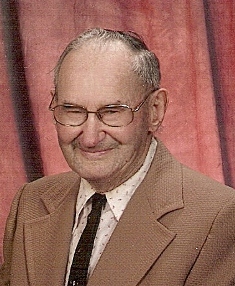 Henry Frank Kluge, age 94, of Mauston, Wisconsin passed away July 6, 2013 at his home in Mauston. Funeral services will be 11:00 a.m. on Tuesday, July 9, 2013 at the Immanuel Lutheran Church in Adams, Wisconsin. Rev. John Krebs will officiate. Interment will be at the Oak Grove Cemetery in Portage, Wisconsin at a later date. Visitation will be 10 a.m. until the time of service on Tuesday at Immanuel Lutheran Church. Henry was born February 6, 1919 in Portage, Wisconsin to Bernhardt and Elsie Kluge. He worked many years for Behlings Transfer in Portage, Wisconsin. Henry married Meta Klein-Manglos on November 2, 1985 in Baraboo, Wisconsin. He enjoyed hunting, fishing, gardening and other outdoor activities. Henry also enjoyed helping with various church activities. further survived by nieces, nephews, relatives and friends. Henry was such a joy to know, and care for. My deepest sympathy to his family. God Bless you all. I’ve known Henry for many years and have seen his determination to keep going through numerous health problems that would have brought down many others. He was a kind and gentle soul who loved the outdoor life of hunting and fishing. His children were always nearby finding time to step in and help, no matter what the need. God Bless him and give him peace. May God help those left behind to learn to live without Henry, his wit and humor. Please accept our sympathy and sadness for Uncle Henry’s passing! May God give you comfort, strength and peace during this very difficult time! We will keep you in our prayers!